GUESS WHAT. I made us a summery peach drink! AND. This is a booze-free peach cider! Booze free, guys. No rum. No wine. No rosé. Just delicious (for lack of a better word) sparkling peach cider that everyone can enjoy. I KNOW. I won’t be mad if you add a little bourbon. But trust me. It will disappear either way. This peach cider came about when we were on vacation because it popped into my head and I could NOT stop thinking about it. Well, not just really popped into my head. We would be driving down the road and I’d keep seeing signs for peach cider. Like non-alcoholic peach cider. And that sounded SO incredibly wonderful to me in the moment. I NEEDED the peach cider in my life. Instantly. And I have not been a weird craving person this pregnancy. Spoiler alert: I didn’t get the cider on the side of the road. I did something better and made it at home. So! Here’s how it went down. I followed this recipe for pear cider that I made back in the fall, but I decreased some of the spice because I didn’t want it to taste too fall-like. I used one cinnamon stick and a split vanilla bean for lots of wonderful vanilla flavor. This can be a PROCESS. Well, scratch that. It is a process. It’s a mostly hands-off process, but I simmered the cider for around 3ish hours so the maximum flavor was really there. It’s worth it! I promise. Once the cider was seriously peach infused, I allowed it to cool, doubled strained the solids (lots of vanilla bean remains which I think is cool because you see the little vanilla flecks!) and mixed it with a sparkling soda. OH MY GOSH. This is so refreshing and wonderful. Plus, with all the extra fruit it’s like a non-alcoholic sangria. Freaking love. You can add whatever the heck you want to this because it’s super peachy. Raspberries and cherries were in my fridge and about to lose their luster, so in they went. Other fruits will slightly flavor the drink, but nothing like the peach base! And fresh mint is a given because it lends a light, refreshing taste and in a weird way reminds me of peach lemonade. You can also add different italian sodas to mix fruity flavors. FUN. So these are your weekend plans now, right?! frozen peach slices for serving and keeping it cold! Combine the peaches, sugar, cinnamon stick and vanilla pod in a large stock pot and cover with water. You want the water to be about 2 inches higher than the peaches. Bring the mixture to a boil, reduce it to a simmer and cook for 1 hour uncovered. After 1 hour, you can mash some of the peaches (they will just fall apart). Cover the pot and simmer for another 2 hours. After 2 hours, let the mixture cool. Strain it through a fine mesh sieve (I did so twice) to remove the solids. Some of the solids may remain. You can strain it through cheesecloth one more time if you’d like! At this point, stick it in the fridge so it chills. It’s great warm, but since it’s summer, we want it to be COLD. Before serving, mix the peach cider with the soda water or peach soda (if you can find it). You can also use any other flavor of soda or seltzer you’d like. 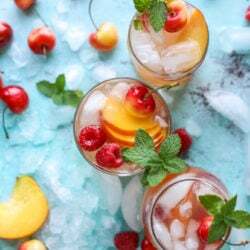 To serve, add in extra fruit (like cherries or raspberries) and use frozen peach slices as your ice cubes. Garnish with fresh mint. And yes I guess you can add a bottle of wine in there too! Oh. My. Gosh!!! I need it to be summer here in Australia so I can get amazing peaches and make this!!! Oooo can I make this with other fruit?? Not pears or apples but something else? Is there any fruit you wouldn’t recommend? I feel like this might be good with pineapple or pineapple raspberry. This is just the prettiest drink I have seen all summer. I cannot wait to try this! Wondering if I could make it in my slow cooker? thanks ashlyn! i bet you totally could! Hello! My name is Thirst Trap. And I am going to need you to come quench my thirst with you peach cider. I’m making this as soon as possible. Peaches are my favorite summer fruit, and I’m always looking for an excuse to use them. Ugh – this looks SO GOOD! I can’t wait to make this! It sounds incredible, and your photos are simply amazing. Thank you for the recipe! This looks so refreshing! I wish I was sipping on this right now! I followed the directions completely but when I finished the two hour covered simmer, and strained everything, there’s was only about 1/2 cup of liquid. Is this right? It’s super concentrated but I was imagining more liquid? Letting it chill overnight before tomorrow adding the sparkling water. hi jillian! there should definitely be more than 1/2 cup liquid… was the cover on your pot completely? it sounds like the liquid evaporated, but if it was covered for 2 hours, it shouldn’t have had anywhere to go!